Buying skis may seem like a daunting task, but after you answer a few simple questions, ski buying will be a snap! Trail skis or touring skis? Will you be doing most of your skiing on groomed trails, or will you be breaking trail? If you'll be breaking trail, you want touring skis. Touring skis are slightly wider and more stable, but generally a little heavier than trail skis. 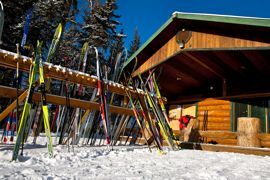 This guide will focus on trail skis, which are more suited to places like our own Birchwood Trails. Classic skis or skate skis? Do you want to classic ski in tracks or do you want to skate ski on wide, flat, groomed trails? If this is your first pair of skis, consider classic skiing. Skate skiing can be difficult when the temperatures are low, and winters in Fort McMurray are usually long and cold! Not sure which type of skiing you want to do? Come to a lesson and give the club skis a try! Waxable or waxless (fishscale) skis? Fishscale skis may seem like less work at first glance. Waxing at temperatures near zero can be challenging. If you'll be doing most of your skiing in warm, wet snow you may want to consider fishscale skis. We generally don't get warm, wet snow in the Birchwood Trails in Fort McMurray. Fishscale skis do not glide over the snow as well as waxable skis, which means that you'll be working harder on the trails with fishscale skis. With fishscal skis, the colder the snow gets, the harder you will be working! Luckily, our cold temperatures take the guess work out of waxing, so waxable skis aren't as much work as they may seem. Also, keep in mind that both types of skis will need to be glide waxed. Check out our waxing guide for more information. Buy your skis in person. Getting the right fit is important. Armed with a bit of knowledge, you can make sure you get the right skis for you. Find and mark the balance point (center of gravity or c.o.g.) of each ski. This is oftern marked in the factory so have a look at your skis first! Place both skis on a hard, flat surface. Stand with your toes at the c.o.g. mark and your weight evenly distributed over both skis. With a piece of paper under the middle of one foot, shift all of your weight to that foot. The paper should be pinned, unable to move. Repeat step 5 above for the other foot. If you meet these criteria, these skis are for you! Bindings hold your ski boots to your skis. There are two types of bindings, NNN and SNS, and both bindings serve the same purpose. All you really need to know is that your ski binding MUST match your boot. You have a few options for ski boots. Each option has a range or products, quality and pricing. For simplicity, we'll mention your options and leave the detailed selection up to you. Classic Ski Boots: Classic boots are low cut (below the ankle) to allow for a wide range of motion at the foot. Skate Ski Boots: Skate skiing requires ankle support. As a result, skate boots are high cut and have a rigid support structure for your ankle. Combi Ski Boots: These are the most economical option for new skiers. Combi boots are high cut, with a detatchable rigid guide around your ankle. You keep the guide on the boot if you're skate skiing to provide ankle support. When you switch to classic skiing, you just pop off the rigid ankle guide, and the boots allow free range of motion at the ankles. Again, a word of caution. Ensure your boot type matches your binding type. i.e. If you have NNN bindings, ensure your boots are NNN compatible. If you have SNS bindings, ensure your boots are SNS compatible. Ski poles also come in a range of products, qualities and prices. 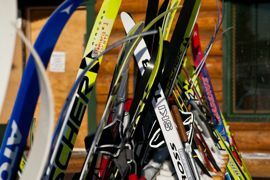 Sticking to the basics, you need to know that your ski poles should be different lengths depending on whether you're classic or skate skiing. Classic poles should just slide under your armpit when the pointy end is resting on the ground. Skate poles are a bit longer, and should come just under your chin when the pointy end is resting on the ground. Baskets, located on the pointy end of the pole, come in various sizes depending on the application. Large baskets are ideal for ski touring. Smaller baskets are used when the trails are groomed. Pole straps vary and are chosen based on preference. It may take a few outings to identify which straps you like best. If you've read all of the information above, and you still have some questions about buying your own skis, please ask a ski club representative. You can find us at the Doug Barnes Cabin on Saturdays during lessons, or you can send us an email. We'd love to help you buy your first (or second, third....) pair of skis!